Gone are the days when visiting the school library meant getting shushed by a stuffy librarian as you fingered through the Dewey Decimal System to find that hard-copy book you need. Education as a whole has evolved, and so has the school library system. The library is the brains of any school from K-12 to university, and today’s libraries are rich with technology and programs that create excitement about learning. Today’s libraries feature e-book editions so students don’t have to wait for returns, impressive inter-library loan systems, and access to fast Wi-Fi around campus. Lucky students have state of the art technology at their fingertips, which allows them to learn on the technology and platforms they’ll use in higher education and beyond. Although some naysayers believe an increasing reliance on technology means a lack of interaction, in school libraries that notion is far from true. Instead, there’s a big focus on encouraging an interactive environment where peer-to-peer learning is regaled. One such space that can often be found in the library is a school makerspace. A makerspace encourages learning through exploration through ‘making’ and experimental play. These creative spaces encourage exploration, engagement, and help to create excitement about learning. Working as a team, collaborating on a project, and depending on peers mimics real-world work and the foundation is in the K-12 interactive school library system. In addition to programs like Makerspace clubs that encourage interaction and peer-based learning, the technology embraced by libraries is also focused on more of a team approach. Librarians are going on tech roadshows, hosting talks on the latest technology ranging from drones to 3-D visual goggles. Of course, not all libraries have the budgets to secure state of the art technology, but there’s been an increasing interest in in-kind donations and securing grants to bring the latest technology to schools. What better place to house, teach, share, and showcase than in the libraries? Hybrid learning is also quickly growing in appeal, with some students opting for satellite classes or online learning for part (or all!) of their K-12 experience. Such an approach removes geographic barriers and encourages libraries to bridge the gap between traditional brick and mortar schools and the hybrid/online environment. It’s especially critical in an online environment to ensure collaboration and interaction takes place. Once again, libraries are often central to making this connection since they serve as the major resource for materials. In recent years, tremendous attention has been paid to the physical setup of work stations at companies like Google, where cubicles and offices got the ax. Instead, everyone is on equal footing with semi-open floor plans. Some companies have open workstations with ample tools like whiteboards for random brainstorming sessions as well as semi-private spaces when a little solitude is needed. That’s being mimicked in libraries, with the school makerspace utilized as the nucleus. In schools, Makerspaces usually feature a variety unique shaped tables to inspire collaboration and creativity. 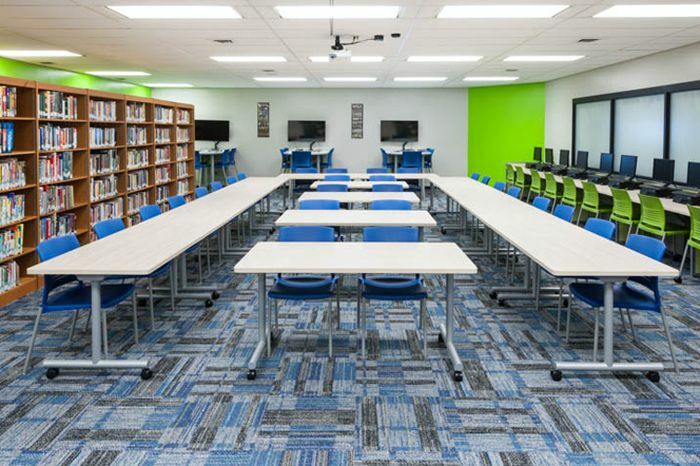 These tables often have a markerboard surface for student brainstorming and notes, or a bright and fun color to add to the sense of fun and excitement about learning. Soft seating areas are popular places for students to slow down and read or research projects. And when it comes to ‘making’ supplies are needed, so storage bins or carts offer easy access to supplies for projects. Collaboration and engagement are critical aspects of a Makerspace so many maker leaders often showcase past work to inspire other students. The next time you visit a school library you might be surprised at what you find. Along with rows of books you will also find fun tables and soft comfortable seating. And more importantly you will see students utilizing and learning about technology and participating in programs that create excitement about learning.